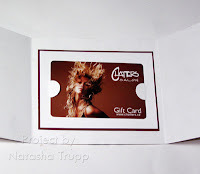 Here is another Starving Artistamps card for you! I started by stamping the harlequin background on mustard. Next, I stamped the big daisy on vanilla. I inked it up with various markers (chocolate, olive, and mustard), then coloured it in with lighter markers (sun, caramel, and celery). Originally, I wanted to place the butterfly on the flower, but because I hadn't introduced any other colours into its wings, that just didn't work out. Instead I placed it flying away, as if it was just passing by, or had just been there. 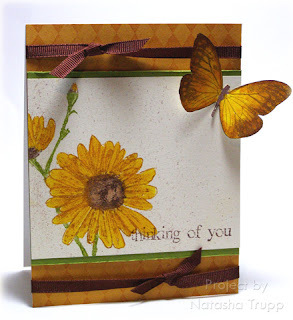 The greeting is from a Sun Spirit Studios sentiment set. I haven't participated in a challenge for a while, and today's appealed to me. I haven't made a more "complicated" card in a while, so it was time for that as well. First, I decided I wanted to do panels with the stem silhouettes. I stamped various images with craft ink then embossed them with clear. 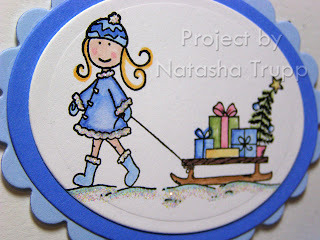 Next, I inked up Friend by Definition with Basic Gray, stamped off once, then stamped on the white. Next, I cut up the big panel into 3 smaller panels. I sponged around the edges with celery, then mounted that onto gray paper. 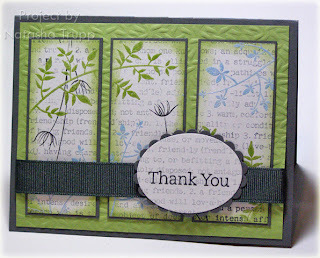 The celery background was run through my cuttlebug with the Fiskars Grass texture plate. Here's another Starving Artistamps card for you! This one is an inspirational sort of card. I liked this sentiment and thought it fit nicely with the bamboo image. 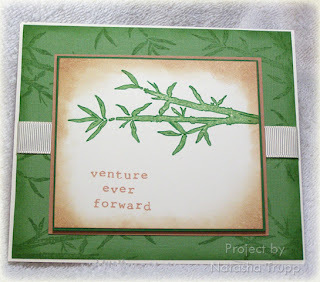 I stamped the bamboo on the vanilla, outlined it with a marker, then the sentiment. I sponged all around the edges, then mounted that on garden green, and again on caramel. 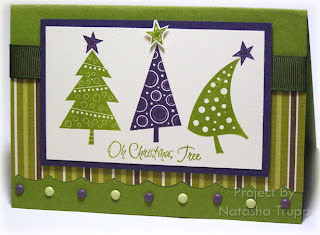 With the bamboo theme, it only seemed fitting to use textured wasabi paper. I like the look that stamping a solid image has on textured paper. I sponged the edges of the wasabi paper, added some vanilla grosgrain, and done it was! I received this freebie set for demos today! So of course, I had to put it together and create something immediately! I used this week's sketch challenge as a starting point. 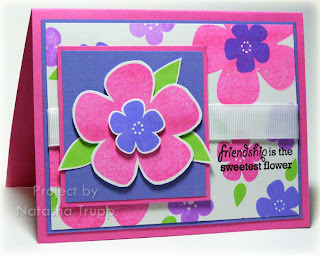 I embossed the greeting on white, coloured it in, then put stickles in the letters and flowers. I stamped flowers in amethyst all around that. Next up, all the flowers. I wanted to have flowers bursting everywhere, so I stamped a few, coloured them in, cut them out, glittered them up and popped up different parts of them. I added a bit of faux stitching on the lilac to pop the framing a bit. First off, a big Happy Thanksgiving to any of my American readers. I hope you have a great day! Secondly, check out the pretty sights from this morning! We had a few centimetres of snow yesterday. 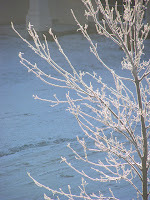 I think we may have had some freezing rain in the night, which makes for very pretty pictures, especially when the sun shines just so. Click it if you would like to see it a bit bigger. Thirdly, I made this card a few weeks ago. I love this whole set from gel-a-tins. I've got both the alphabet and the numbers. I wanted to do something with the numbers, so I thought, why not a countdown. I got a square piece of acetate and started stamping the numbers with white Stazon. 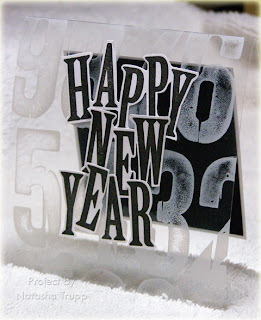 Next, I stamped the letters for Happy New Year (with this set) and cut them out and layered them onto the acetate. As is typical with this type of card, it was extremely difficult to photograph. 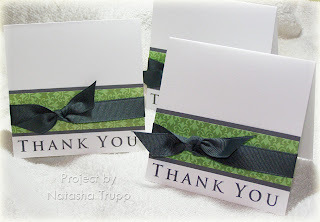 If you were to see the card flat, the black paper, framed with the white paper, would fall nicely behind the greeting. 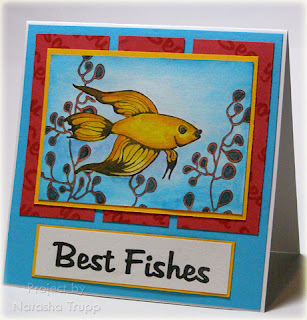 I love this fish image from Starving Artistamps. I stamped it onto Naturals White paper, then masked it and stamped some seaweed all around it. I watercoloured the images with some Twinkling H2Os. I coloured in the seaweed with a maroon gel pen. The background panels were stamped with the sentiment "sea you soon" in ruby. The card is quite big, 5.5x5.5. I figure for a best wishes/fishes type of card, a big size is good- more room to sign it from a large group! A few weeks back Jami issued a challenge. Use the color Pretty in Pink in your card or project somehow, somewhere. The images from Elzybells are small, but lots of fun to colour. Because they are winter-themed, I just could stay away from adding to the snow with glitter, stickles, and liquid pearls. So, for this card, the first thing I did was colour in the stamped image. I used SU! markers, pretty in pink and regal rose for the jacket and tuque. Her hair and the log were coloured with caramel and cocoa. That left the bird, it had be stumped for a bit, but then I thought, why not red? It worked, especially for such a small element. For all the snowy parts, I applied liquid pearls, for the coat trim I applied stickles. While both of those were still wet, I poured more glitter on! 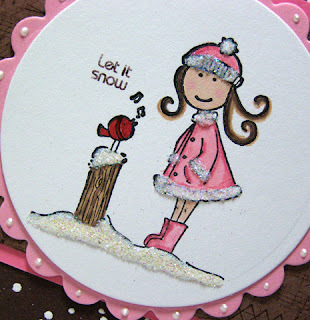 I stamped a corner of the repeated "let it snow" stamp from Glad Tidings, then set it aside to dry. Because patterned paper was off limits, I set about making my own. I used a Sheet Music stamp several times on cocoa. I applied some of the x-stitch-like images along the top and bottom. That went on regal rose, then I tied some rose ribbon on that. 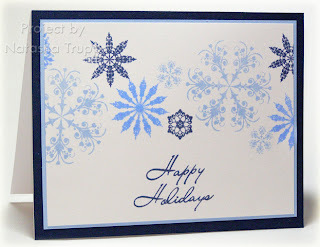 The card base is chocolate chip with white snow embossed all over. Finally, I added little dots of liquid pearls in the pink scallops, and rounded the corners. So there it is! Here's a close-up of the main image. When you spend that much time on something, it's nice to share it in all its glory. Be sure to check out the others cards here! The Flourishes Design Team announcement was early today. I am now on their design team! I am joining: Design Team Leader Sharon Johnson, and design team members: Tracy Durcan, Leslie Miller, Dee Jackson, Janine Tinklenberg, Lisa Somerville, and Kelly Sampson! 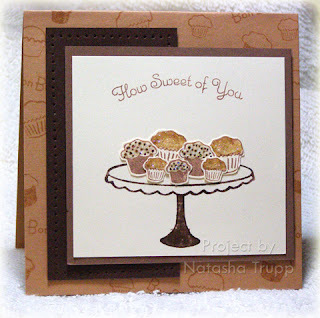 I made a little Flourishes card this morning, with Sweet Treats. 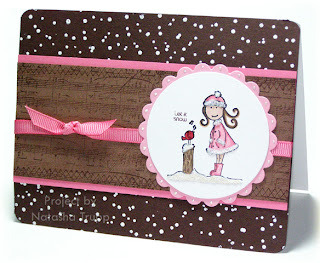 I stamped a variety of treats and the word Bon Bons for a fun background on the caramel. Next I inked up the middle plate from the tiered image. I stamped a bunch of treats on vanilla paper and cut them out, placed them all around the plate, then added some stickles for icing. It's funny, when using these images, I have a hard time staying away from the yummy sounding papers- caramel, chocolate, cocoa, and vanilla. I also did a little bit of paper piercing around the chocolate layer, it's better seen in person. Today was the Winnipeg Crop at Wenchie's place. It was lots of fun, especially being see what fun stuff everyone else brought. Both the swirl cuttlebug folder and the stamp set were supplied by Cindy. I was in a colouring mood, so I was happy to see this set. 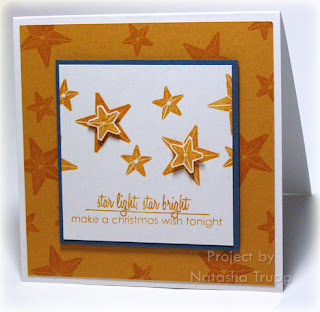 I stamped the image onto Naturals White, and coloured it in with just Stampin' Up! markers and one 10% grey prismacolor marker, no blender pen, no aquapen, nothing else! I just got this fun set, Meet Me at the Cafe, by My Favorite Things. I don't have many line art sets, so this one works well for me. It also has some really fun phrases in it, like the 2 in the background (good friends and good times). It's one of the things I love about clear stamps, being able to use the word stamps to create a diagonal background. The image was stamped and embossed, since I don't have any alcohol marker proof stamp ink. Even with embossing powder, you have to be careful, the markers still can pick up the black. I coloured this in with a few graphic artist markers and Copics. The little white bit on the wine glasses is from the signo gel pen. I finally picked up a second pen. I keep one with my stamping stuff (for faux stitching, touch ups, etc.) and one with my markers (for highlighting purposes, such as this). 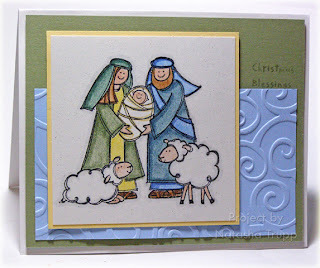 In regards to a question, yesterday, yes the greeting on the card is from the Take a Bough set, take a look here. Today is the 15th, you know what that means- Dirty Dozen reveal day. This month was a really fun theme, Deck the Halls. Check it out here if you're a fan club member! Lots of good holiday decorating and card ideas! It's funny, as is typical, I can never predict what project of mine will be best received. And so far, the favorite is something that came to me last minute yesterday and didn't take longer than 20 or 30 minutes to make. It just makes me laugh. You never know, do you! I received this set about a month ago, and have barely used it! These stars called out to me. I love all things starry. I can never have enough star stamps (although I am picky about them, they need to be a clean style, symmetric, or at least bold). Anyway, this card is quite simple. I made it while I was still on my square card kick. There is some glitter on the 2 popped up stars, but it's hardly noticeable in the photo. I thought that mustard, navy, and white made for a classic, almost folk-art colour scheme, perfect for Christmas! 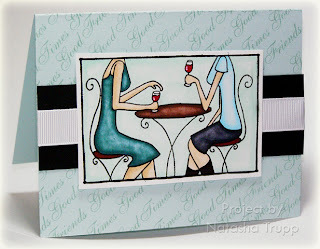 This was a card I quickly threw together for a stamping get-together. The main panel was stamped first, then embossed with pearly glitter embossing powder (like iridescent ice, but more rainbow reflectant). I had kind of forgotten about these 2 stamp sets. They really work quite nicely for a festive card. Two of my not-so-favorite foods, but the colours? Fabulous! It's funny, I actually started out with the colour scheme first, and then found the paper to match. However, I had my eye on using this paper for a few weeks now, so it was probably in the back of my mind, somewhere. I started with the vanilla panel, stamp a few trees from Oh Christmas Tree, added the sentiment and a few stars, then that part was done. Next up, I scalloped the paper with a corner rounder. I wanted a bit more decoration on the card front, so I punched several holes in the bottom, and filled them with green and purple brads. The ribbon added the finishing touch, before mounting the focal image with pop dots. This card is kind of a weird size. I thought my original piece of paper was 8.5'' wide, but clearly, it was not. More like, just under 8'' wide. Whatever, it still works, and it still fits in a standard A5 envelope! I was at Michaels the other day, picking up a few more cheap clear blocks for a Christmas card get-together, and I saw that they actually had the Series 6 studio g stamps. This birthday one was too cute to leave there, especially at $1.50 for a set of 5. I picked my paper first, from the stash. One thing I have done to make the stash a little more bearable for me as a cardmaker is cut it down to 6x6 squares. I have come to terms with that fact that scrapbooking just isn't for me right now. So, instead of leaving all that pretty paper in awkward 12x12 format, I cut a whole lot of it down into the card friendly 6x6. I have been keeping it in the Paper Trey Ink packaging. It fits 6x6 paper exactly. Just thought I'd throw that out there as a tip. Anyway, I started with the paper. I believe this one is by One Heart, One Mind. I took my colour palette from that. It's not a 100% match, but it's close. I used Sage Shadow and Creamy Caramel for the cupcakes, with Not Quite Navy and Pumpkin Pie for the candle. I cut them out, popped them up onto a word background, put a thin layer of stickles on, and voila! Done. I have been on a square card kick lately. I made at least 3 square cards today. Have you seen these darling stamps?? They are called Elzybells and are super cute. This one is called Girl With Sleigh. I coloured it in with mostly SU markers, the snow was coloured with a Copic. I added clear stickles to the white parts of her snowsuit and the snow. Here's an up close picture of the main image, so you can see all the details. Here's the card itself. I kept it fairly simple. I mounted the image on some oval die-cuts and popped that up on a 4-1/4 square confetti white card base. I added a little bit of brocade wide grosgrain and tied a paper star charm on. The word joy was handwritten, since I couldn't find any stamps small enough. I sat down at my craft table tonight, and this is just what happened... I guess I was in the mood for some extra bright colours. It was snowing today, well, more like freezing rain, so very dreary. Not much has stuck so far. I decided on the set Bloom by gel-a-tins, then went with a fun colour scheme- pink, purple, with a touch of green. I was thinking "tween". 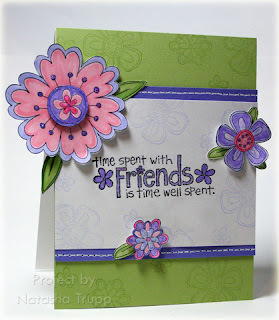 I started by making a stamped background with various flowers. The leaves are from PaperTrey Ink's Beautiful Blooms. The layout it one of my basics. It's a really easy layout, but with a little ribbon, a few dimensionals, and some cut out images, it can really pop! The sentiment is from PaperTrey Ink's Green Thumb. I had a mission this weekend, my mom required a birthday card that also served as a gift card holder. I started with the basic shape of the card and the gift card first. I knew I wanted to use my slit punch as the card holder, so I started off with a piece of paper 4-1/16x3-15/16. I traced the card onto some scrap cardstock and used that as a guide for where to punch. This allows you to perfectly place the gift card without damaging it. The card itself is 11 inches long, with the middle panel being about 4-5/8 wide. Next up I needed a colour scheme. I drew my colours from the gift card itself, first picking out burgundy, then 2 other colours from the same colour family, artichoke and saffron. I went with a floral theme since I knew it would make a nice pattern. 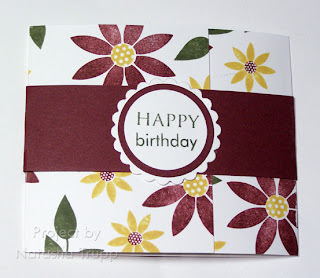 I used PaperTrey Ink's Beautiful Blooms. Here is a photo of the card without the belly band on. The belly band is simply an 11x1-1/2 piece of burgundy. 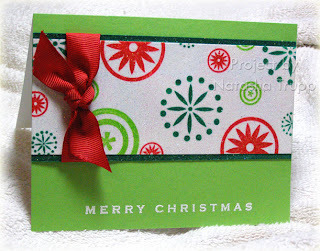 I wrapped it around the card to determine where to fold it, making sure to leave a little bit of give, but not too much. The label on the belly band covers the edges, and was made with circle nestabilities. Here's the finished product. If I was really picky, I would've been a bit more aware of the off the page stamping. It doesn't match up, but it does the job. When I was in Grand Forks last weekend, I had to go to the Super Target. I headed straight for the stationary section. Sadly, they didn't have too many notebooks left. However, I still managed to pick up two and this 6x6 coil notebook was one of them. I had Mix & Mingle sitting on my desk for the last 2 weeks. 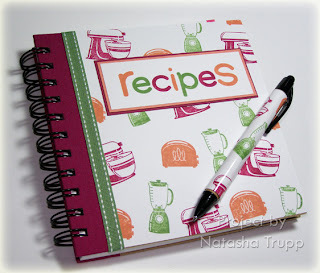 Once I had this notebook, I KNEW I had to make a recipe book. Although this would make a great gift, this one's for me. I'm going to fill it with my favorite family recipes. My colour choices were largely dictated by that pink strip on the notebook. I sat and looked at it, thinking, what colour matches that?? Then it dawned on me, Purely Pomegranate! And that colour reminded me of one of my favorite combinations- pomegranate, guava, and wasabi. The title part was made using the Oh Gosh Be Golly Alphabet . This is one of my favorite alphabets, it's always reminded me of Jell-O jigglers, so it seemed fitting to use it on a recipe book! For the pen, I covered my stamped paper with packing tape for extra protection, before adhering it to the pen. Accessories, etc. : 6x6 Target notebook with pen, wasabi double stitched grosgrain, sticky strip, packing tape. Here are two of my designs for this year's Christmas Card. So far I've only cut enough paper to do 16 of each, but it's such a quick and easy design that I can cut more if or when needed. This was my intended design all along, but it just so happened to fit with today's Limited Supplies Challenge: Make a FLAT holiday card! When I'm designing the annual Christmas card, I take several things into consideration: It needs to be quick and easy, it should have simple measurements, there should be less than 4 layers, the less embellishments the better, no knotted ribbon, that sort of thing. I tend to have at least two styles, then I have varieties of each. I often make mail-friendly ones, as seen here, as well as hand-deliver only ones (those ones usually have ribbon or extra embellishments). So here's the first one. 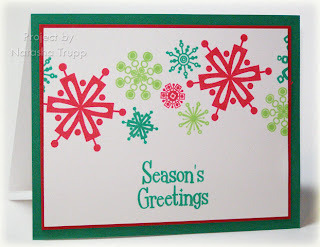 It's a bit more fun and funky, using mini Retro Flakes and Holiday Cheer for the greeting. To make a bit more special, I spritzed it with shimmery spray once I was done. It's subtle, but nice. For the second one, I was going for more classy look. The mini fancy flakes were perfect. You know how there are different types of people you send cards to. Some people on that list just don't seem like retro, funky people, so perhaps classic, fancy snowflakes are more appropriate. In keeping with the more classic look, I chose all blues. The monochromatic look really adds a bit of elegance. Once again, I spritzed it with shimmer spray to add that little something. 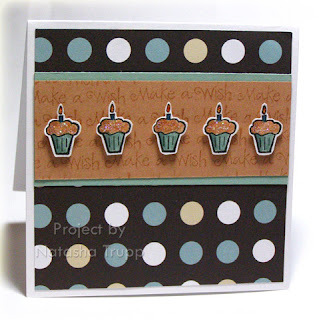 I just wasn't in the mood for a full-sized card today, so instead, I went with this cute size- 3x3.75. It provides just a slightly bigger canvas than the 3x3. This extra space enables me to do one of my favorite quick layouts- a large off-centered focal point, with ribbon behind it and knotted to one side. 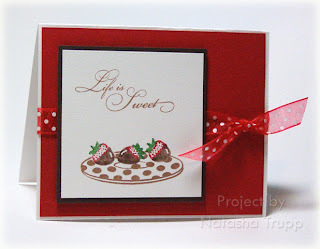 I stamped the strawberries from Flourishes Sweet Treats over top. The greeting is also from that set.